Editor’s Note: The Square Deal would like to welcome our Corporate Communications Intern, Aly DeShields, to the blog! Aly will soon begin her senior year at the Ohio State University where she is studying Strategic Communications and Business. A native of Pittsburgh, PA, Aly loves the Steelers, traveling to new places, and Dave’s Single with cheese. We’re so glad she’s able to spend the summer with us! Growing up, I always looked up to my mom. I still do. She’s taught me so many lessons; like how being kind to everyone will always give me a leg up, that worrying about things out of my control is a waste of good energy, and that no, having that new pair of shoes will not drastically improve my quality of life. I’m still young, but as I begin to cross the threshold into adulthood, I’m positive that I’ll take those life tips my mom ingrained with me as I navigate this thing called life. I think motherly instincts are real and moms usually have the tools you need at just the right time – whether it’s advice (even if it’s hard to hear), a hug, or inspiration when you need it the most. And while I’m only a month into this internship, something I’ve noticed about Wendy’s is that everyone treats each other like family, and my new Wendy’s family is instilling a new set of tools to help me as I begin my career. Some companies tell you that they treat everyone like family, but working at Wendy’s, I’ve actually seen it. And while I’m just over 200 miles away from home, the lessons I’m learning as an intern have confirmed that this is what my mom has been preparing me for all along. I recently had the chance to sit down with Gaylene and Cassidie Weavers, who make up a mother-daughter Wendy's General Manager team at neighboring restaurants in Prince Edward Island, Canada. Gaylene and Cassidie have been with Wendy’s for 30 and 11 years, respectively – Cassidie started at her mother’s restaurant as a Wendy’s crew member as soon as she was old enough to have a job. After a few years as a shift manager, Cassidie followed in her mother’s footsteps and became a General Manager at just 20 years old. Today, they are both rock star Top 200 GMs, and the pair attributes their success to something special that not all employees have: the mother/daughter bond that allows them to lean on each other. During our chat, I was most interested to hear about what they’ve learned from each other and how they’ve navigated their experiences with Wendy’s, both as members of the same family AND members of the Wendy’s family. Cassidie was kind enough to share five important lessons she has learned as a Wendy’s General Manager. And honestly, the lessons she’s learned are applicable across the board, no matter who you’re dealing with. From customers to crew to family, Gaylene exemplifies doing things the Wendy’s Way. So, it’s really not a surprise she’s a top GM and that Cassidie is following in her footsteps. 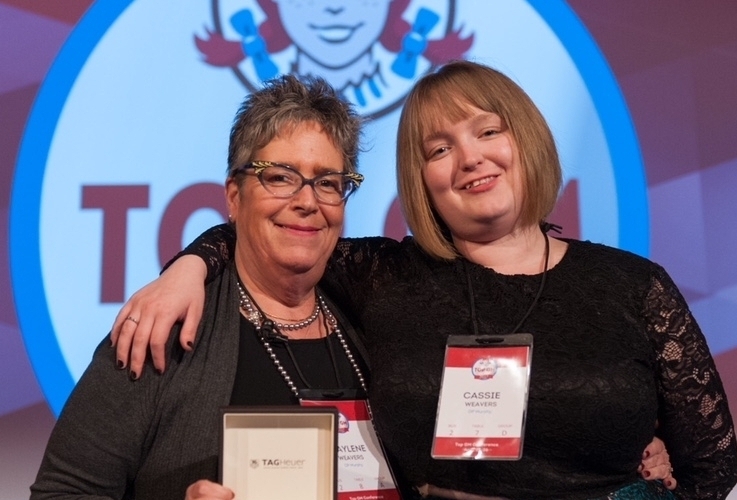 Gaylene and Cassidie Weavers, a mother-daughter duo who are both Wendy's General Managers at Wendy's Canada Prince Edward Island locations. It’s no secret that the food service industry requires a lot of interaction with a wide-range of people – customers and co-workers a like. Cassidie shared that while she once was a shy teenager, working at Wendy’s and watching her mom interact with customers has really helped her break out of her shell. Today, you can find Cassidie chatting with anyone who walks through her restaurant doors and passing down her knowledge to her team. At Wendy’s, we strive to delight every customer, but it isn’t always easy. Cassidie says that Gaylene has taught her not to take criticism in the restaurant to heart, a lesson that has made it easier for her to clear her head and solve conflicts efficiently. Cassidie has never worked anywhere other than Wendy’s, but it took a lot of hard work to become a General Manager. Luckily, Cassidie was able to watch her mom advance her career with Wendy’s too, so she knew that treating people with respect and doing the right thing were the keys to eventually running her own restaurant. As with any job, this one doesn’t come without its challenges, and Gaylene has always encouraged Cassidie to stay positive. Approaching each day as a fresh slate lets Cassidie know that what happened yesterday doesn’t need to carry over, and that mentality allows her to focus on what’s important: delivering a quality product in a comfortable environment with a happy team behind it all. Cassidie shared that their franchise organization encourages all Wendy’s team members, in all four Wendy’s restaurants on PEI, to build relationships with one another. Gaylene taught Cassidie to treat her team members like family, which means celebrating birthdays and asking for advice, even if you might not like the answer. No matter which family you’re dealing with – your work family or your actual relatives – they’re the ones who have your back and continually push you to help you grow, just like Gaylene and Cassidie.